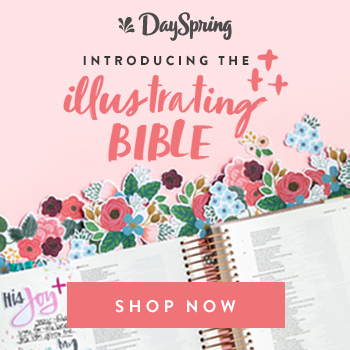 Bible Journaling friends, you’ll understand when I say I live for the site-wide sales at DaySpring! I always have a running list of favorite goodies, and it’s a great time to pull the trigger and purchase those at last when everything goes on sale. Well, that time is now. Today, DaySpring launched the 25 percent off site-wide “Live Your Faith” sale. The only exclusion is Willow Tree gifts, and everything else from Bibles to Bible Journaling supplies and books, cards, gifts, jewelry and absolutely E V E R Y T H I N G else is 25% with code FAITH25! The newest Women of the Bible Kit “Imperfect Hospitality” is now available! Kit-of-the-Month – ALL OF THEM. The newest Women of the Bible kit called “Imperfect Hospitality” launched today, and it is amazing. What’s even better is you can grab it plus both of the other Women of the Bible kits today, and instead of $75 for the three, you’ll pay around $56! That’s almost a $19 off with coupon code FAITH25, my friends. Love that! Journaling Bibles: Now is a great time to get a fantastic deal on the journaling Bibles you love. Even though the Illustrating Bible is out of stock right now, there are some great choices, including the (in)Courage Devotional Bible (which I adore) and one of my favorites because of the large print and beautiful cover, the Large Print Crossway ESV Single-Column Journaling Bible in Summer Garden. Bible Journaling Kits Aplenty: All of the kits are including in the sale, even ones from past months and years, including favorites I’ve used in Flippy Doodle workshops many, many times. One of my favorites from past years is the Only One You kit. It was featured quite a while ago but it is super colorful, has these AMAZING eyelash stamps as part of the stamp kit that I’ve stamped on virtually anything that will hold still, and I’ve used this kit many times for Intro to Bible Journaling workshops because it’s just beautiful and so very uplifting. It’s normally $19.98, but with the code on sale it’s only $15. Mugs and Bottles and More Mugs – oh my! Confession: I try to pick up cute and inspirational mugs on sale and stash them in my “gift box” in my closet. When I need a quick gift or the perfect “thank you” for a friend or colleague, I like to grab a cute mug from my stash, fill it with something fun (coffee beans, candy, yummy teas or other treats) and surprise someone with it. And this Filled With Joy ceramic tumbler is among my favorites because it’s so bright, cheery and beautiful! Cards and Stationery! I am a big fan of handwritten cards, and it seems to be a dying art form. If you’re like me and you value opening the mailbox to find a handwritten message from someone, stock up on cards for every occasion while they’re on sale. My challenge to you is this: On a day when you’re feeling down in the dumps, pull out an encouraging card and send it to someone to cheer them. Doing this helps me take the focus off myself and lifts my spirits just knowing it’s blessing someone else! Devotionals – for you or for gifts! The choices here are nearly countless, and there are so many amazing ones of course. For my Bible Journaling friends, I highly recommend the 100 Days of Grace and Gratitude and/or the 100 Days of Bible Promises by Shanna Noel. These are such beautiful devotional books, and the paper is super heavy and perfect for embellishing with paint, stamps, stickers or whatever your crafty brain wants to use! And just one last thing – I know, I know, I said 7 things, but you’ll thank me for the bonus one! Sale and clearance goodies ARE included in the sale, so do not skip this section! I loved finding this cute little Conversation Starter Jar (great for ice breakers for your small group or at dinner with the fam! ), which is already half price on sale, but with code FAITH25 it becomes only $7.50 (more than 60% off!). Thanks, friends! If you find things you can’t live without during the sale, let us know what you grabbed! I confess I have already ordered gifts for a friend and some goodies for the studio this morning (and I suspect I’m not yet done for the day…). Happy sale day! And please don’t forget! Use code FAITH25 at checkout for the discount. Sale ends Monday, April 1!